So my son, ‘The Pok’, has deepened his love of books and stories. His ability to read has in the last months of 2017 just “clicked”. No longer am I reading him bedtime stories about mice and bears in the woods. 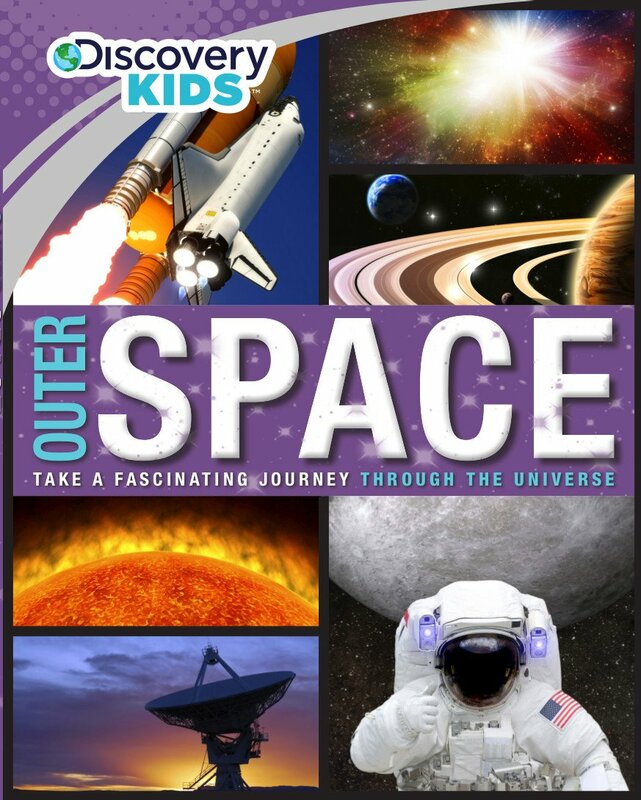 One of his favourite bedtime books is Discovery Kids – Outer Space. 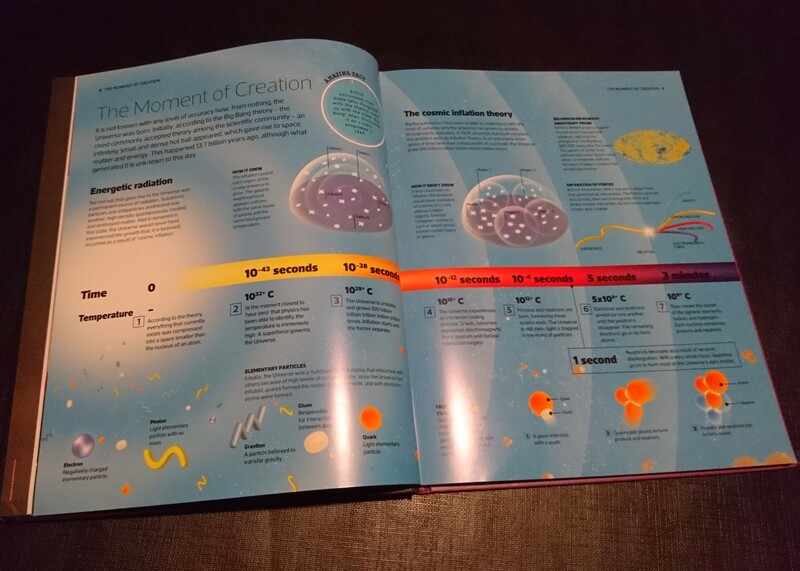 It is a beautifully illustrated and detailed book geared towards kids but also is a sufficiently rich introduction to real astrophysics for adults too. I believe that part of the allure of the book is the fantastical nature of the science details contained within. ‘His favourite part of the book, that we have read too many times to count, is about the Big Bang. “The Pok” can’t get enough of it, whether it is the part about everything starting at a small singularity or the incomprehensible timeline that the theory stipulates. The part that we have “debated” a number of times now is how can the cosmic inflation happen if nothing travels faster than light. Of course there are some things that can travel faster than light – the Millenium Falcon in hyperspace doing the “Kessel Run”, but I digress. So with this question having the opposite effect of gently bringing my son to sleep through bedtime reading, I asked him whether we should ask someone who may know the answer. He looked around and saw his Mum and sister in the room and was a bit confused. So I told him that I would use my phone to ask someone on the internet… via Twitter. So I posed the question to the physicists that he knew; Professor Brian Cox, Doctor Neil deGrasse Tyson, and I threw in Professor Lawrence Krauss, all via a Tweet. I wasn’t expecting a response, as I’m only a random member of the public asking a question via the internet to three of the most prolific science communicators and advocates in the English speaking world. To my astonishment, five minutes later I received a response from non-other than Professor Brian Cox. 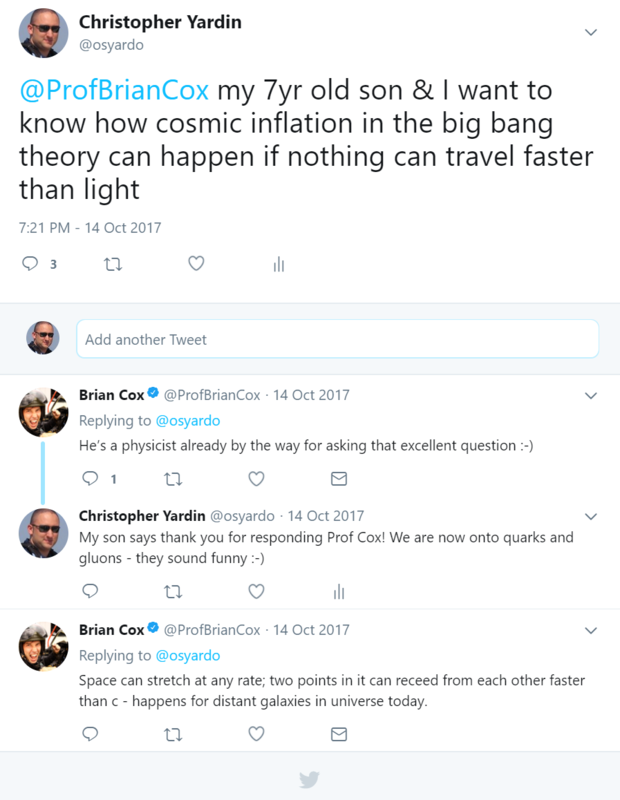 I could not wipe the smile from his face, but he did ask me how Prof Cox knew the answer. I proceeded to explain that many more years of school and work gave the esteemed Physicist the knowledge about how the universe works. And with that question settled, we moved onto the quarks and gluons reading them out in our funny voices poking fun at their silly names before drifting off to bed.